AB Arboga Mekaniska Verkstad of Sweden have made, over the years a wide range of products: power shears, press brakes, eccentric presses, chip crushers, straightening machines, wire-drawing machines tube draw benches, small and miniature milling machines, a miniature universal machine and a very wide range of drills. Their popular EM825 (and later very similar U2508) mill/drill was a well-made and versatile machine with a geared-head based on the company's similar range of small drills and co-ordinate and radial-arm drilling machines. The machine appears to have superseded two earlier version, the E135 (fitted with a single-speed motor and a 100 to 640 r.p.m. speed range) and the next version, the very similar-looking, 2-speed motor equipped E830 with speeds from 80 to 890 r.p.m. Whilst the early models are rare the EM825 was heavily promoted and sold well in both European and North American markets from the 1950s to late 1970s. Today (2019) the mill-drill is still made in a slightly modified form as the "Strands" by Gnosjo Maskin & Verktyg - and sells for around US$7800 or GBP5000. Raised and lowered by a crank-operated rack-and-worm mechanism (fitted at the back of the 4" diameter column) the swivelling head was equipped with both fine down-feed and a rapid-action drilling quill with 41/2" of travel. To keep the head in alignment during vertical movements the rack was ground on both edges and let into the column, an adjustable gib strip being provided to take up any lateral play that might develop during service. From the centre of the spindle to the column was 107/16" and the maximum distance from the spindle face to the table 12". The micrometer dials were fitted with vernier graduations to 1/500". a) 100, 205, 250, 440, 510, 885, 1040 and 2080 r.p.m. b) 100, 205, 345, 440, 695, 885, 1450 and 2900 r.p.m. Various sizes of table were available, but the one most commonly found has a working surface of approximately 17.3" x 9.43" with 11" inches of longitudinal movement and 6.5" of cross travel. Most seem to have been fitted with ball thrust races on the feed screws and some with ball races where the shaft passed through the of the casting. An oil-immersed, power-feed gearbox was an option but, being very expensive, is rarely found. Very heavily built, the head, once tilted over, could be difficult for one person to hold whilst the retaining nut was tightened. Although the vertical position was held by a locating taper pin, once outside this setting the head was secured by friction alone and on a limited surface area. However, experienced long-term owners report that this is not a problem and that even under heavy cuts the rigidity of the head is not compromised. At some point in the late 1960s it appears that the original EM825 was superseded by an interim model, a heavier version with the larger column and table that appeared on the next generation of Arboga millers, the U2508 (the latter also being built as a copy in Taiwan during the 1970s and 1980s). There are one or two details about the spindle that are worth knowing: it was fitted, as standard, with a 3-Morse taper, with a tang knockout but, because the spindle line was blocked by the motor above, without a draw-bar for holding cutters in the head; instead, a screwed ring on the spindle nose retained a "slotted" washer which was slipped over the neck of a cutter between its Morse taper shank and the cutting edges. Only one "washer", distance piece and retaining ring were required for the full-size 3-Morse fitting, but to hold tapers of No. 2 and 1-Morse in adapter sleeves (and the special drill chuck) a total of five were needed. These items are still available, but very expensive, the parts for the 3 Morse holder alone costing over £240 in 1999. In addition, before a standard "Autolock" chuck can be used in the head, it needs to be modified to accept the retaining ring and plate; this is, however, an apparently simple matter. If you are going to buy an Arboga, check that the cutter-retaining parts are with the machine, or budget accordingly to buy them. Unaccountably (unless they are, perhaps, Russian copies) some machines have their head assemblies made from "mirror-image" casting; this, of course, has the effect of putting the gear levers on the right-hand side and the quill-feed controls on the left. Fitted to its maker's stand the Arboga EM825 weighed, approximately 530 lbs. Another interesting Arboga product was the beautifully-built, ingenious but rarely-seen UM400, a miniature combination machine..
Of identical layout to the early-1950s designed Arboga EM 825, the U2508 was a heavier and generally more robust machine introduced during the 1970s. The distance from spindle centre line to inner face of the column was actually 3/8" less than the EM825 - but this was compensated for by a maximum table to spindle nose capacity of 20", a massive increase of 8" on the older machine. The quill movement was lengthened by 1/2" to 41/2", the main column diameter increased from 4" to 51/2" and the standard table increased from 175/16" x 97/16" to 22" x 10". Although the cross travel remained unchanged at 61/2" the longitudinal travel was increased by 41/2" to 151/2" . An optional, self-contained, electrically-driven table power feed unit reduced maximum travel by 1" but provided 6 feed rates of 0.75, 1.375, 2.5, 3.75, 7 and 12.5 inches per minute (19, 36, 63, 96, 179 and 315 mm/min). A 2-speed 1/0.85 hp 3-phase motor was standard and drove the No. 3 Morse taper spindle at: 100, 205, 345, 440, 695, 885, 1450 and 2900 rpm - a wonderfully wide range and a considerable improvement on the original 100 to 1280 rpm range. The all-up weight was 605 lbs. During the 1970s and 1980s a copy of the U2508 was built in Taiwan. Although the castings of the U2508 were 'squared-off' and the vertical column more massive, there is still no mistaking the early-1950s origins of its ancestor machine the EM825. While some examples had full-circle handwheels on the table feed screws, others the more traditional balanced-ball type. 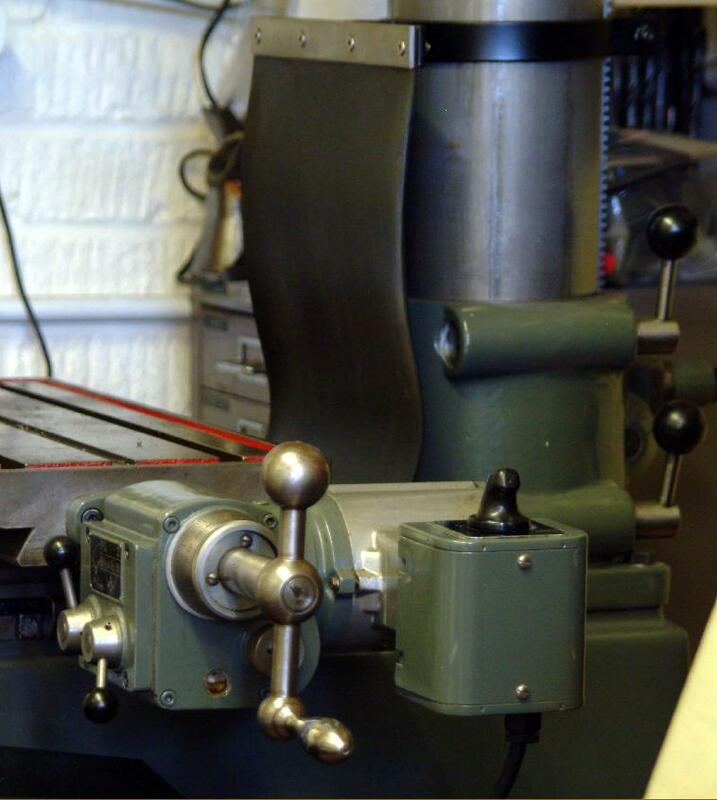 This miller is fitted with the maker's table vice.